Ventricular repolarisation produces the T wave. The normal T wave is asymmetrical, the first half having a more gradual slope than the second half. This is well shown below with an up-slope of a duration of nearly 3 squares and a down-slope in only around 1 and 1/2 squares. 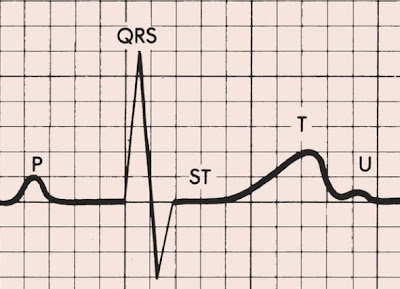 T wave orientation usually corresponds with that of the QRS complex, and thus is inverted in lead aVR, and may be inverted in lead III. 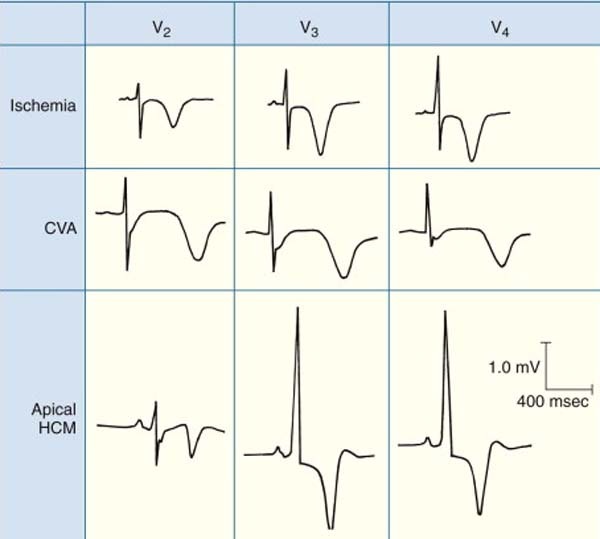 But the T waves are discordant with the QRS complexes in Left Bundle Branch Block (LBBB) i.e. T is inverted while the QRS complex is positive or vice-versa. 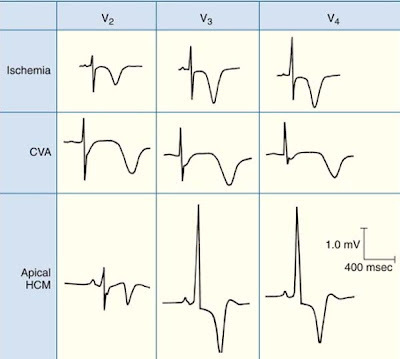 T wave can be inverted in the right precordial leads in normal persons. T waves are commonly inverted in all precordial leads at birth but usually become upright as time passes. A persistent juvenile pattern with inverted T waves in the leads to the left of V1 occurs in 1-3% of adults and is more common in women than in men and more common in black people. Below is an ECG of persistent juvenile pattern with T inversion from V1 to V3. The presence of symmetrical, inverted T waves is highly suggestive of myocardial ischaemia, though asymmetrical inverted T waves are frequently a non-specific finding. T wave inversion associated with QT prolongation can sometimes be seen in cases of CVA particularly in subarachnoid hemorrhage. Particularly prominent inverted T waves, the so-called giant negative T waves, are characteristic of hypertrophic cardiomyopathy with prominent apical thickening. The 3 conditions are shown below. No widely accepted criteria exist regarding T wave amplitude. As a general rule, T wave amplitude corresponds with the amplitude of the preceding R wave, though the tallest T waves are seen in leads V3 and V4. Tall T waves may be seen in acute myocardial ischaemia and are a feature of hyperkalaemia. The T wave should generally be at least 1/8 but less than 2/3 of the amplitude of the corresponding R wave; T wave amplitude rarely exceeds 10 mm.